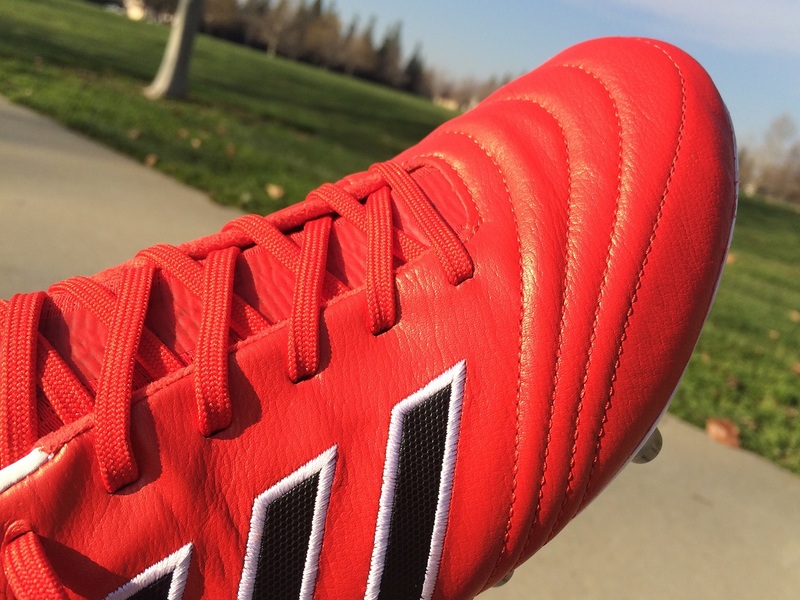 When it comes to heritage style boots, adidas has continually produced the best of the best options for players. Take for example the Copa Mundial, what is the absolute gold standard in boots. Then there was the adiPURE series, followed by the slightly more minimalist Gloro. And now we welcome in the re-imagined Copa 17 series. The adidas COPA 17.1 features a premium K-leather upper, a compression tongue, Ortholite insole and a lightweight SprintFrame outsole. 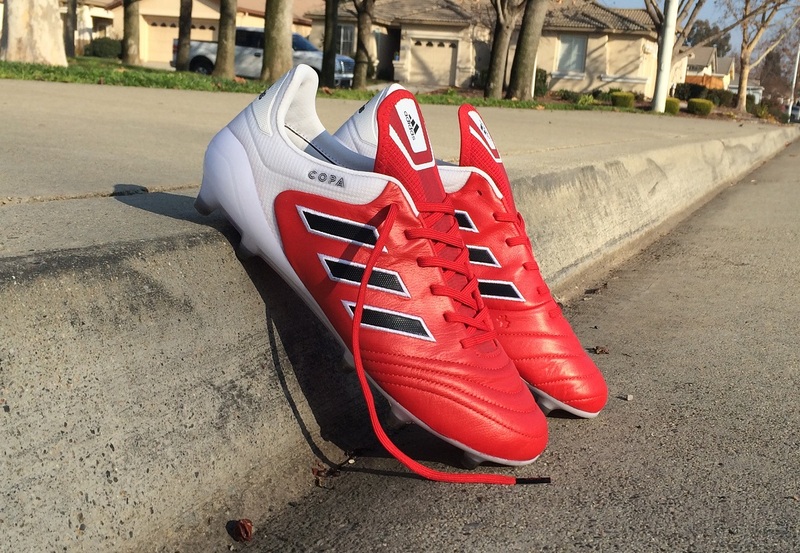 This is the original Copa taken in a fresh, modern direction. Sounds good, right? After several weeks with them and some wear on muddy grass and turf fields, here is how they check out! Check out the current Copa 17.1 line-up at soccer.com. 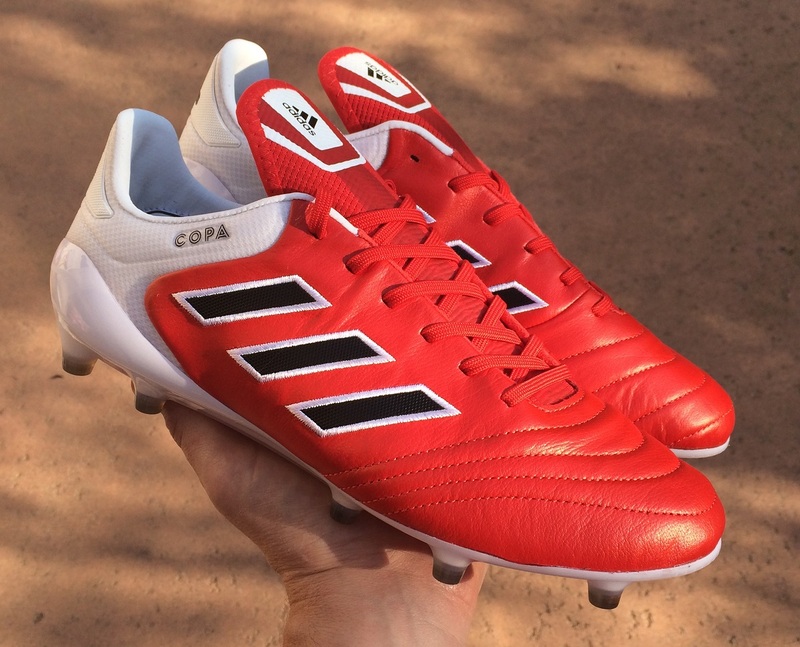 When adidas label these as an “re-imagined Copa”, they aren’t making it up. 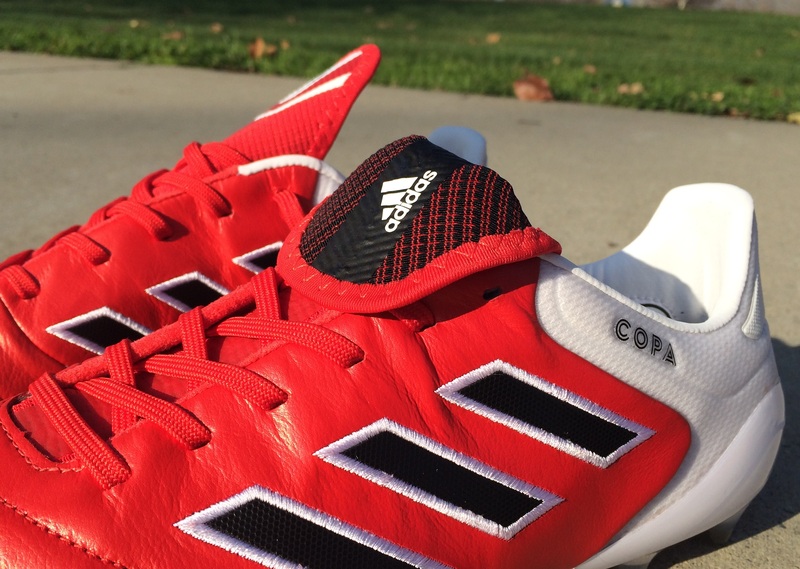 Everything about the Copa17 has been modified directly for the modern game. But it isn’t the first time we have heard adidas come out with that same statement. 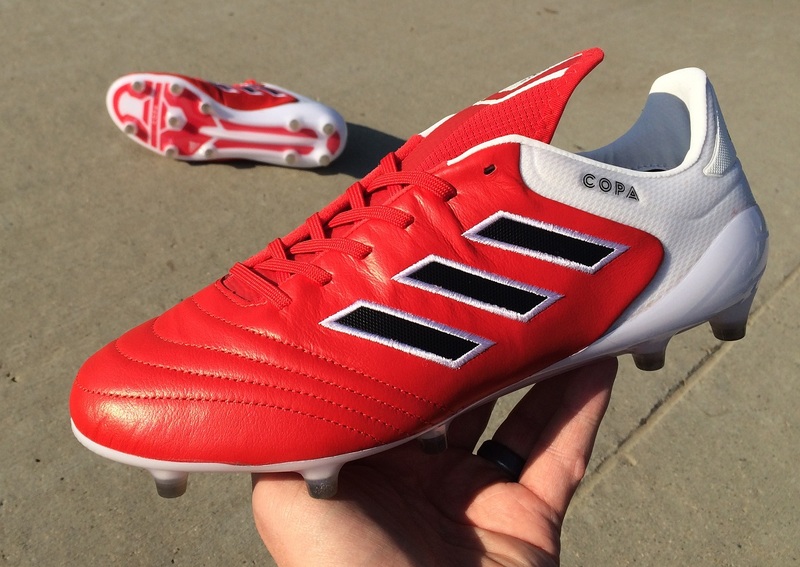 The adiPURE series was the original Copa remake, while the Gloro also had the same originality attached to it. In reality, theses boots are absolutely an adiPURE. If you handed me a pair and said “check out the latest adiPURE release”, I wouldn’t skip a beat. Everything about them falls in line with what the trusty adiPURE was all about. So, although they are a boot to be compared to the original Copa Mundial, they are connected much more closely to the adiPURE silo. To compare it to the Copa Mundial is more like comparing a gasoline fueled car to an electric. They look the same on the outside, but a lot of the pieces are manufactured differently. If there is an area of heavy expectations, this would be it. How could adidas possibly release a heritage boot without the comfort part? Well, they haven’t, and I can tell you that these don’t disappoint. Right out of the box, the k-leather upper is super supple and ready for action. There really isn’t anything better than taking a boot right out of the box and knowing from your first moments with them that they are going to be a real treat. The stitching through the forefoot contours the natural shape of your boot. In general, stitching will help improve the durability of a leather upper, but in this case it also encourages some natural stretching in areas where your foot needs it. As you slip your foot into the boot, you will notice how easily the entire structure molds to your shape. All of the materials are designed to offer a natural feel and it really does create a feeling of comfort and security right from first wear. In my opinion, this is one of the most important fundamentals of really enjoying what a new boot has to offer. Some other notes here. Inside the boot, adidas has included two uniquely shaped, padded panels around the heel to give you a more locked in feel. I’m talking deep padding like I haven’t seen before, but the material inside is plenty soft and I never seemed to notice it in play. Underfoot, you get a beautiful Ortholite insole that is spongy yet lightweight. Quickly following along in the comfort discussion, the inner cage system that adidas has employed needs some attention. Rather than being positioned like it normally would be on a regular release, the larger than life compression tongue actually goes down underneath the footbed on both sides of the boot, creating a natural cradle effect around your foot. adidas uses the stretchy, knit material to create a more supportive fit through the midfoot. Depending on how you like your fit, the compression through the midfoot can create a unique fit, especially through the arch. In the past, I haven’t been a fan of tight structured fits, but on this occasion I enjoyed the extra snug end result. What to do With the Tongue? This has already proven to be one of the more controversial areas of the boot! Rather than being a regular ankle cut, adidas has gone with an extended style. The material used has a stretchy, elastic feel, so it is very easy to manipulate across the front of your foot without impacting comfort. You can technically wear it as is, extended up along the ankle, or you can look at the option of folding it over. The fold over is not like you’d find on something like the original Copa, primarily because there is no stitching used. Without the stitching, there is no structure to the fold and as a result, it is not guaranteed to hold the fold down. In play, I wore it with the tongue extended up, in what is its natural position. While wearing them, I had numerous friends comment on the tongue design. And to be honest, by the time they pointed it out, I’d completely forgot about it. In other words, it never created any issue in terms of comfort and actually feels normal to wear. Side note here, you won’t be able to cut the tongue off. Well, you could, but you are not going to want to. The material has an elastic nature, so cutting it will break down te general structure through the tongue and you are likely to have strings hanging out everywhere. Next up would be the outsole and the ever impressive SprintFrame design. Rather than being a SprintFrame design for straight up f50 adiZero speed, there is more of an emphasis on producing a balanced traction system here. This is an updated, modified design for a different category of boot. 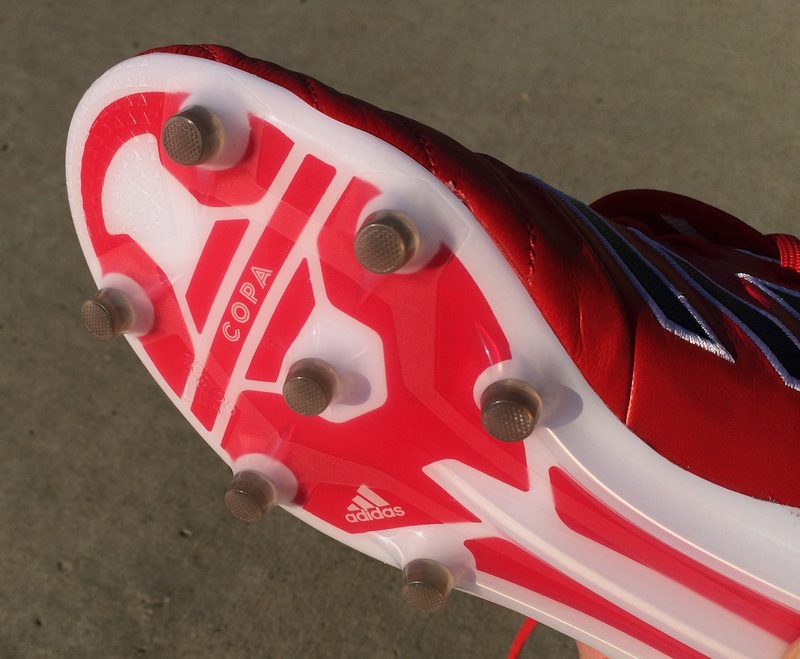 adidas deliver with the wide plate and low profile conical studs creating even weight distribution through wear. And best of all is the fact they can be worn on both FG and AG surfaces. The latter is obviously important, and although adidas hasn’t directly stated they are AG ready (like they have done with previous, recent releases) they are well suited for turf. The stud positioning is pretty standard, wit 4 studs in the back and a 2-3-3 formation sitting toward the front of the boot. If you want to get wild with the soleplate, note that it can bend in both directions across the toe bend, just as Puma’s Gradual Stability Frame does. 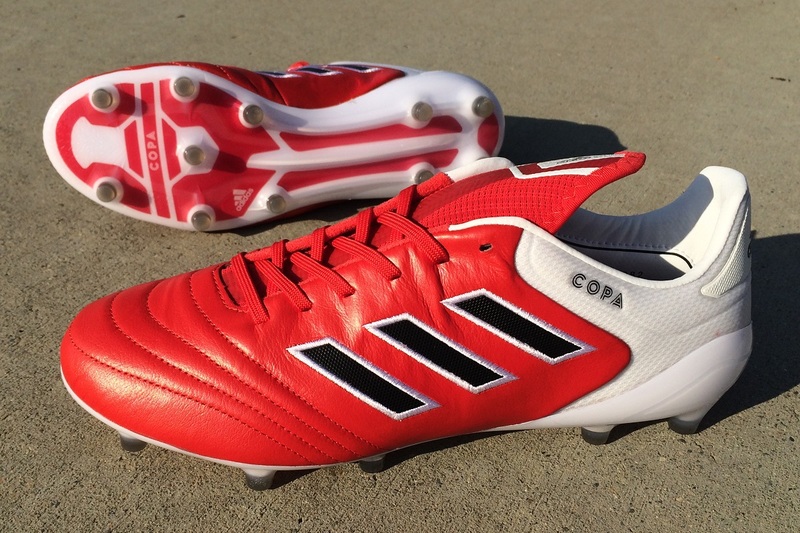 This additional flexibility sets these apart from the likes of the Copa Mundial and its stiff plate. Plus, it ensures a more comfortable ride through wear with plenty of springback. Do note that there is a deep spine that runs through the center of the boot, from about the midfoot back through the heel. Please don’t try to bend that area! Lets go back to the K-Leather upper for a second and how it feels on the ball. First off, this is obviously not a power boot and there are no external elements to give it some additional oomph. Instead, you are getting a steady and reliable passing boot that provides a natural level of feel on the ball and clean touch. Again, it is a k-leather, so it feels ultra supple to the touch and that level of softness increases over time to give you even better touch. There is not a great deal else to talk about here, just note that the leather acts and molds just like you would expect. Very naturally! I would call these a pretty optimal true to size option, with normal length and an accommodating forefoot width. The leather will offer some stretch over time, so there is potential that it will move from a medium/wide fit to a wide fit over time. From my experience with them, there was no overstretch in the leather. Through the first few wears I couldn’t definitely feel the material loosen slightly as the boot adjusted to my fit, but there are no areas where the leather has strayed away from that form fit. Something else worth noting is that the midfoot is slightly wider than traditional releases, so there is plenty of support to keep your foot grounded. Although I haven’t worn them nearly enough to give a concise answer, I’m in no doubt that they are NOT as durable as the Copa Mundial. How could they be? 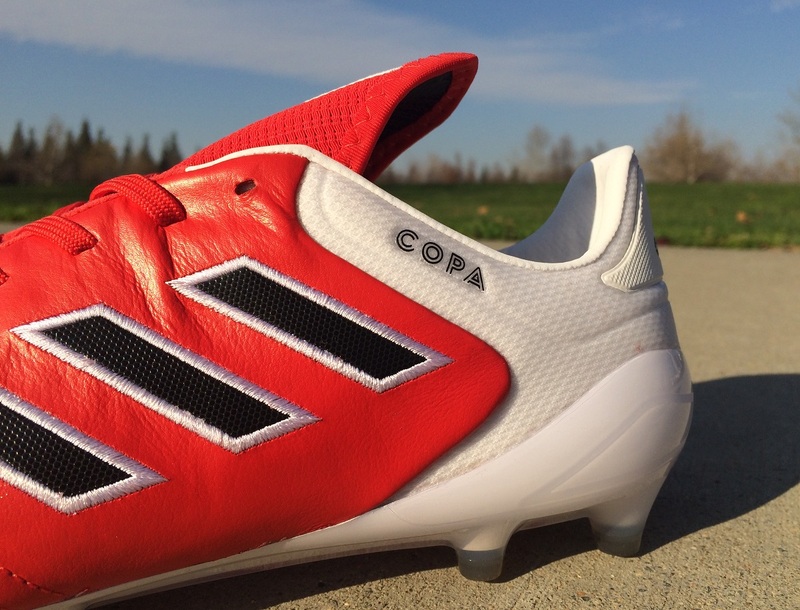 The Copa Mundial was built to last, with no corners cut in its construction. The Copa 17.1 weighs in at 7.4oz and offers a balance of comfort and performance thanks to its trimmed down design and modern materials. I do expect these to last longer than the Gloro, and I am confident that players will get a solid season out of them. But in general, this is an area where they are no match for the master! There is not a whole lot to knit pick on here. The Copa 17.1 is a very fundamentally solid release, with a perfect balance of attributes. The compression tongue design might cause problematic to some players that don’t like pressure around the arch, and I won’t be recommending them as an option for players in need of a narrow fit. Outside of that they get the thumbs up! And in case you were wondering, I’d definitely choose the Copa 17.1 over the Copa Mundial as my boot of choice! To date, there have been three Copa 17.1 colorways released. Find them all available at soccer.com. Highlight: A modern take on one of the games most iconic boots, emphasis here on producing something lightweight that mixes top-level comfort with performance. Features a k-leather upper. Would I Buy Them: Absolutely, these were a great boot to test. If you are on the market for something with a little more class, these are a solid option. 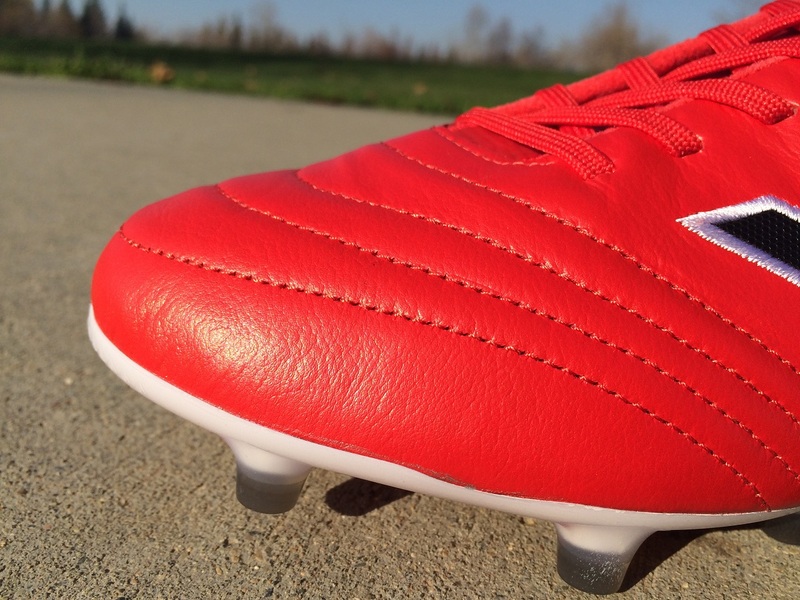 Player Position: Given their design, they are not necessarily a striker specific boot. But outside of that, they are a very flexible boot that will sit right with most players on the pitch. Love the style of these and what they promise to offer on the pitch. My only gripe is with Adidas dipping their hands further into our wallets. $200 for the Copa 17.1 is a tough pill to swallow compared to the Gloro for $110 or $135-$150 for Copa Mundials. I know the Copa 17.2 is $100, so I’m curious if they are only half as good…Any chance of a review of them for comparison’s sake? Let me put it this way, I'd much rather 2 pairs of Gloro than 1 pair of Copa 17. Very good point, and I'll try put a post together on it! I've got the turf version of these and I don't like the tongue at all for the following reasons? 1) Protection. A leather boot would normally offer you good protection. The compression tongue doesn't at all. 2) The "compression" itself is just rubbish. Its a subtle inhibitor to good circulation in your foot. 3) It slightly gets in the way of the midfoot of the boot molding to you feet in the way a leather boot should. Points 1 and 2 are the show stoppers. Point 3 isn't the end of the world. Simply the best I've ever owned. And, at 43 yo. I've owned quite a few. Not only have I had Copas, I have a pair of Gloros. I've also owned Morelia II MIJ, Puma King Finale SL I, Pantofolos, Tiempos, and Phinnish II. These are the perfect shoe as far as I'm concerned. Do not let the price deter you. The 17.1 seems to be the culmination of every aspect I have loved with all other boots I have owned. I have taken them through 5 pickup games and 3 league games, and like them a little more every time I wear them. If you want a lightweight, comfortable boot with a great first touch, strikes shots pure and solid, and lets you play any pass you want (including the delicate chip over the defender) these are the shoe. That sounds like an advert. Are you sure you don't work for Adidas? Are you sure you don't work for Nike? Its actually quite funny you should say that because Nikes boots have never fitted me at all, and I have quite a strong dislike for the materials they use in most of their modern boots. So no – I don't work for Nike. Mizuno Morelias II is my favourite boot at the moment, but apart from that out of the major companies it tends to be Adidas I look to first for boots. I just think they have got it very wrong with the compression tongue, and find it a bit weird that none of the reviews out there give any real details or analysis on how it performs. You really need to play in it for quite a few hours before you become aware of how the compression aspect is affecting you (although the lack of protection is obvious from day one). I'm really not trying to start a tedious internet flame war, or be excessively negative about this boot without good reason – so please accept my apologies if I appeared to be doing so. What's the difference between the comfort sole plate on the old Gloria and the sprint frame on the 17.1? I stopped wearing f50's a while ago because I could feel the studs poking through the sole, which caused blisters and hotspots. The comfort sole plate never had this issue. But you mentioned the sprint frame on the 17.1 is different from the typical f50 sprint frame? Haven't heard of it being a common issue to date, so I'd say no. Any comments about the sole separation so far? I’m looking to buy one of these this weekend. Still holding strong, no issues being reported! They get a thumbs up when it comes to durability. Having owned the adipure 4 sl I expected a similar feel.. These are super locked in, compared to the adipures they offered a very relaxed feel. The leather is not as soft as I expected but keen to see how it pans out over time.